Hiking Staff - Tall Size. 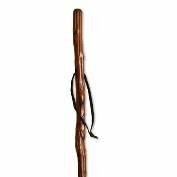 Solid wood hiking pole with leather strap and built-in compass. All natural wood varies in color, shape and grain. Tall size for extra support.